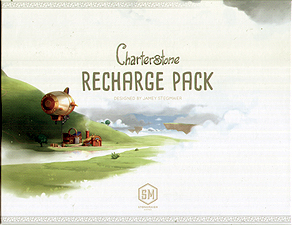 This recharge pack contains the components for a second campaign of Charterstone. It is completely optional, as Charterstone is designed to be infinitely replayable after the first 12-game campaign. Do not open this pack until the first campaign is complete. For all components found in this pack, set aside their original counterparts. Some components (non-printed components like coins, resources, meeples, etc) will not be replaced and instead should be reset back to their original locations. Use the back side of the game board for the second campaign.